There’s a nice little art exhibition currently on show at the HATCH Contemporary Arts Space in Ivanhoe until 9 September. It’s called ‘States of Being- The Elemental Importance of Water’ and it features the work of nine artists, including the curator, that explore the concept of water in its various forms- river, sea, ice, cloud etc. There’s a series of paintings on glass that capture the ‘glimpse-like’ nature of the Yarra River as you walk along its banks in Heidelberg and Ivanhoe. You rarely get a sense of the whole river here, because the trees and bends of the river break up your view of the water. There are a couple of installations that play with water in its liquid form, and a series of tapestries that capture the sight of water seeping through the inland desert as seen from the sky. I was very taken with a video that overlapped still photographs of Iceland, watching clouds form and dissolve around a mountain-ringed lake. Quite mesmerizing. Will I? Won’t I? I’d better make up my mind- it’s on Monday 4th August. The latest foray into Australian Indigenous history by national award-winning Aboriginal writer Bruce Pascoe is set to re-ignite the long running debate about the true nature of Aboriginal civilisation at the time of European colonisation. 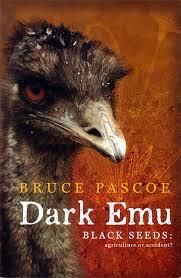 Dark Emu – Black Seeds: agriculture or accident? is a significant new contribution to the academic and social discourse about the true history of pre-European Australia and its Indigenous inhabitants. Bruce is an acclaimed writer, having won the Prime Ministers Literary Award for YA Fiction, 2013, for Fox a Dox.is a Bunurong man. He is a member of the Wathaurong Aboriginal Co-operative of southern Victoria and has been the director of the Australian Studies Project for the Commonwealth Schools Commission. Bruce has had a varied career as a teacher, farmer, fisherman, barman, fencing contractor, lecturer, Aboriginal language researcher, archaeological site worker and editor.His books include the short story collections Night Animals (1986) and Nightjar (2000); the novels Fox (1988), Ruby Eyed Coucal (1996), Ribcage (1999), Shark (1999), Earth (2001), and Ocean (2002); historical works Cape Otway: Coast of secrets (1997) and Convincing Ground (2007); children’s book Foxies in a Firehouse (2006); and the young adult fiction Fox a Dox (2012). Local historian Mick Woiwod, author of engaging, very well researched books including Last Cry, The Christmas Hills Story, Diary of Andrew Ross and Once Around the Sugarloaf will introduce the evening.